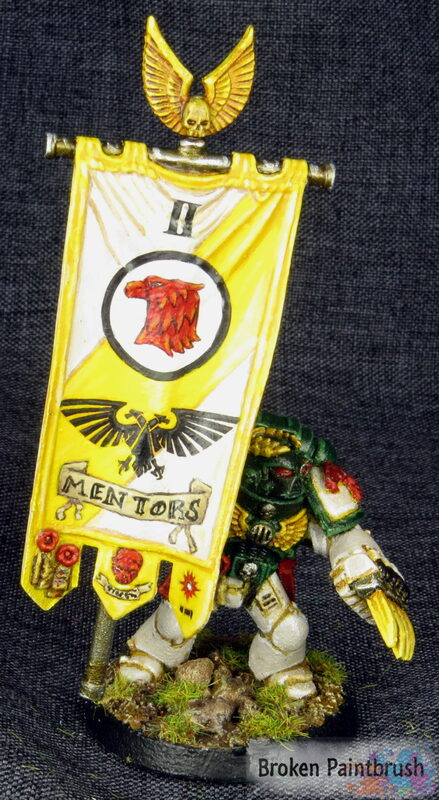 Today I have a tutorial on painting custom Space Marine banner, in this case for my Mentor Legion but the ideas could be easily transferred to any Space Marine chapter. Unknown photographer of Games Workshop painted model, used without permission. I also found a handy PDF on Bell of Lost Souls (I know…) that had real basic banner designs for each company. So with a rough idea of what I wanted, I then dug through my pile of water transfers to find the starting point of each element. Like these sort of tutorials? Make sure to sign up for my newsletter. Not only will it keep you up to date on Broken Paintbrush, but I also send links to other great tutorials from around the web. 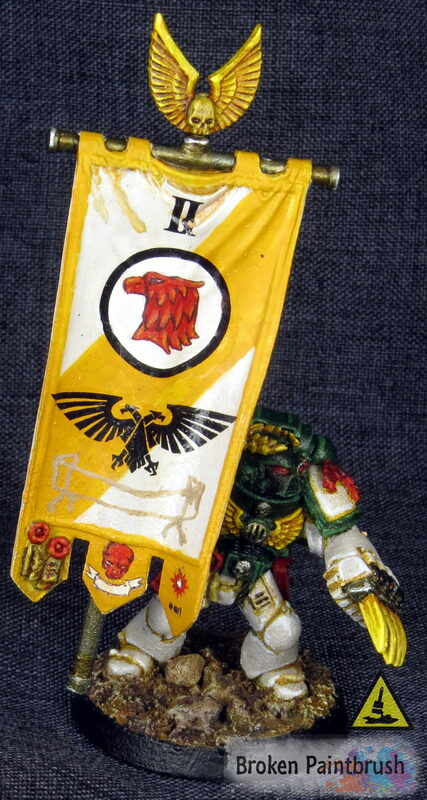 The main banner was already painted with Pallid Wych Flesh that I have been using for my Mentors armor color. Ignore the ugly wash stains, those will get fixed later. The yellow was then blocked in with Averland Sunset. I started by using the colored end of GW’s paint brush as a measuring device (accurate I know!). The top and bottom edges were one segment from the edge and the outsides were two segments from the border. This gives the nice offset slash I was looking for. The marks were then connected with a thin line so that the diagonal was formed. The lines weren’t straight but that’s ok at this point. The yellow areas were then fully filled in with Averland, using the lines and the slightly raised edge as the markers. Now where I had messed up, I went back with Pallid Wych Flesh to clean up. After everything was dry, I used ‘Ard Coat to create a glossy, smooth layer for the next steps. I started adding the water transfers I had found to create the basic forms. The Imperial Fist icon from the vehicle sheet was used for the circle, I simply cut out the fist section. I started with this to get the placement for the rest in relation to it. 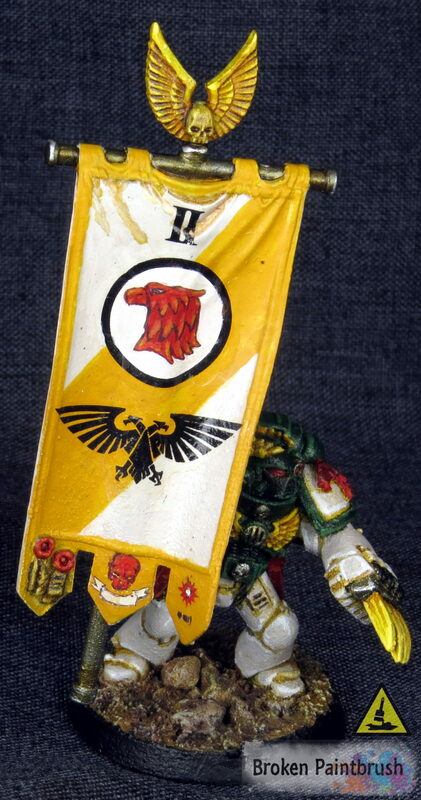 The white Raptors symbol from Forge World was then added to the middle of the circle. The Imperial Eagle was then added underneath and the numeral II above. For these transfers, I finally used Micro Sol [pick it up on Amazon] and it is AMAZING. 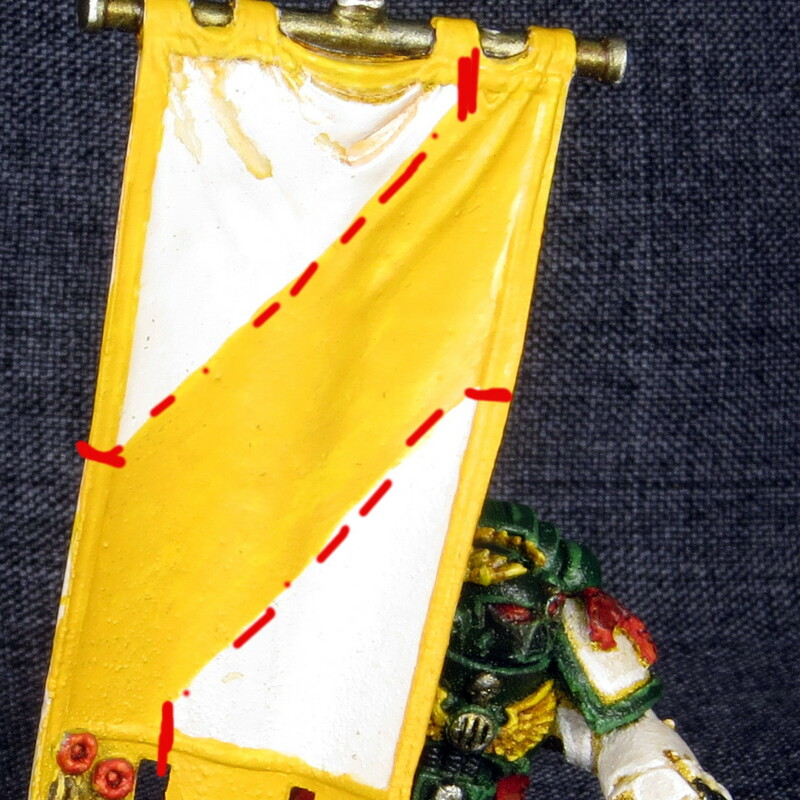 I will do a more detail post on this magic elixir, but it really helped the transfers form into the folds of the banner. Now here is where some of the magic happens. 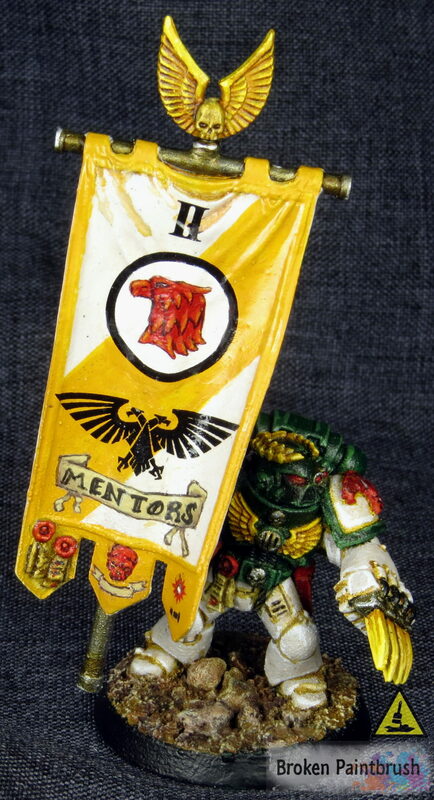 I used Mephiston Red to paint in the Mentors eagle head and the skull below. Just use the transfer as a guild and paint a few layers until it has a good coverage. 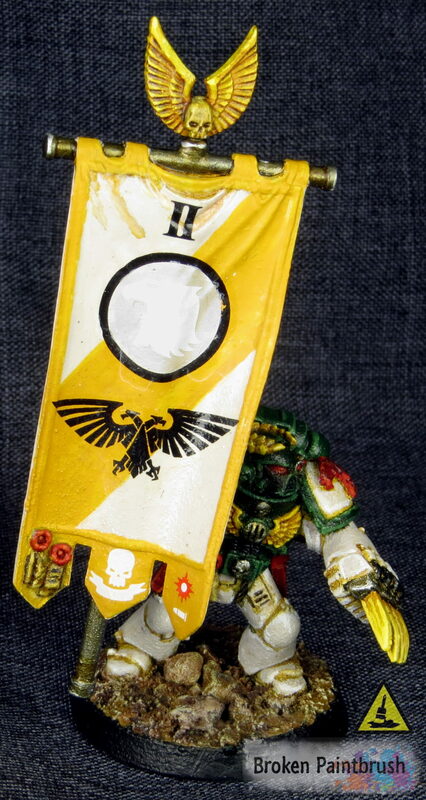 The white areas were painted over with Pallid Wych Flesh to cover up the missing decal pieces and match the background. Evil Sunz was used to highlight the red while black was added to add some shading. Finally, black was used to outline the icons and create additional details. There were no decals for the scroll work at the bottom so I had to do those free hand. 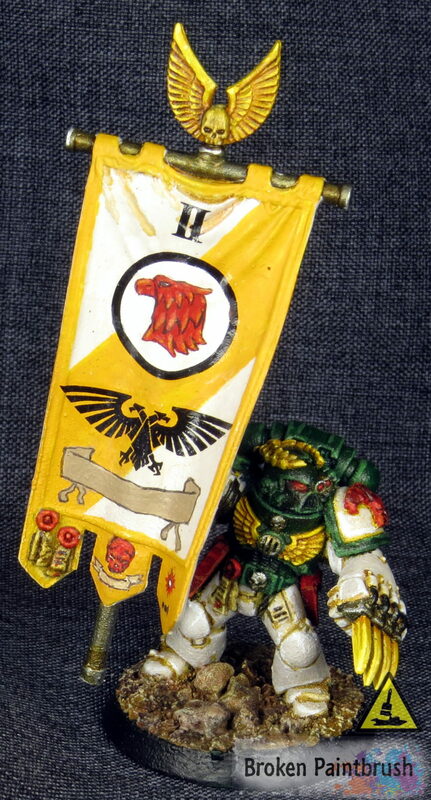 With the codex in front of me on the wonderful page full of banners, I grabbed my Baneblade brown and got to work. I first added the two vertical lines on either end, this provided the width as well as a uniform height for the scroll. The two horizontal curves were then added. Looking at the artwork, I didn’t want large, sweeping curves, just a slight arc – enough to add interest. Finally, the folds were added by adding the triangle to the top corners and bringing the line straight down through the bottom. The tatters were my attempt at mimicking the artworks. I simply then filled in the scroll with baneblade brown. The yellow and white were also touched up along the way. To add detail and help the scroll standout from the banner I used thinned black paint to create the border. This also included emphasizing the fold at the top. I then used Zandri Dust and Ushabti Bone to create the highlights, including most of the main part of the scroll in Bone. Again much of this was using the artwork from the codex as a reference. Black was mixed into the Baneblade Brown to create the shadows. To create the lettering, I first used a pen on paper to get the words in front of me in the style I was aiming for. I could then get a sense of spacing between each letter. I started with the ‘T’ in the center, very lightly with watered down black. The ‘M’ and ‘S’ were added to either end of the scroll before sketching in the other letters. Once I was happy with the spacing and size of each letter I filled each one in and added the little details such as serif and double lines. Now that the main elements of the banner are complete, I started added highlights to the colors. The yellow was brightened up with Flash Gitz, but leaving the Averland in the recesses. The white was highlighted with Ceramite White on the top edge of any wrinkle. The black was highlighted with Adeptus Battlegrey, but as you see in the picture above I went a bit crazy with it in some areas. This was later toned back with black and gray mixes. 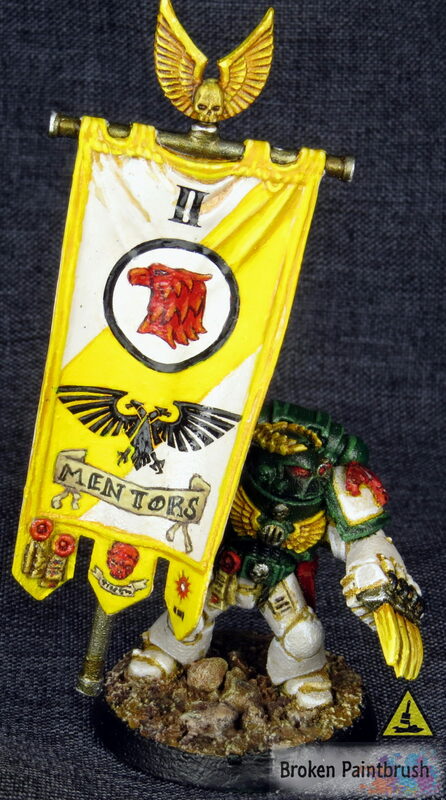 To finish the banner white was added to the Flash Gitz for extreme highlights on the wrinkles while the black was cleaned up. To add shadow I used Baneblade brown mixed in with the base color and layered in on the bottom side of each wrinkle. 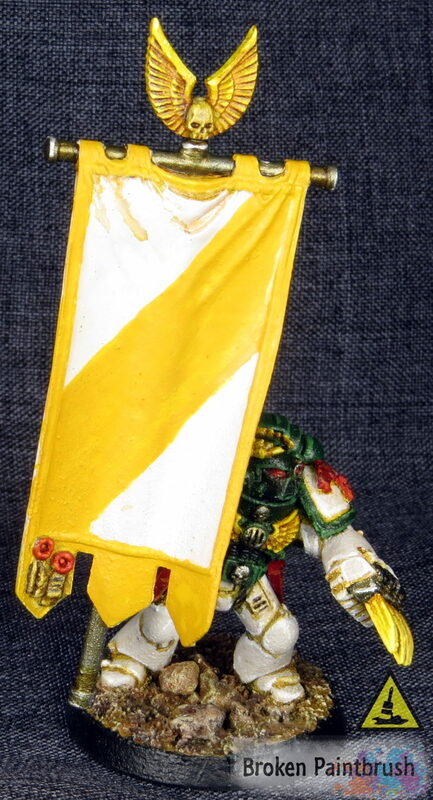 I also used the Baneblade to darken the line between the yellow stripe and the white field. Finally, once everything was dry I applied a few coats of matte varnish to seal it up and remove the gloss sheen. 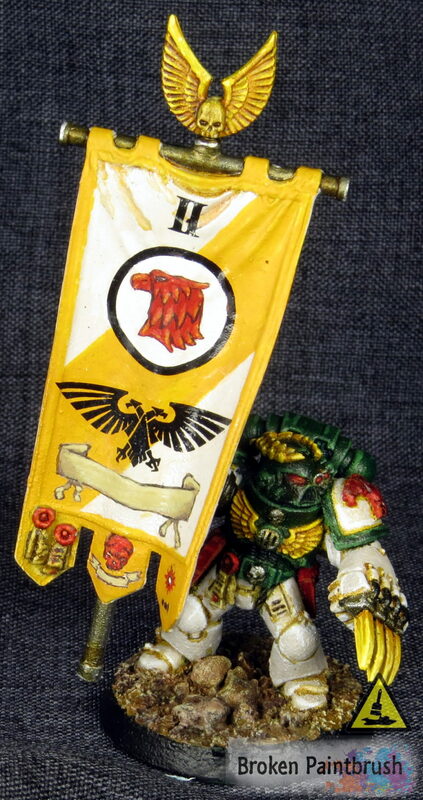 I hope you found this tutorial on painting custom Space Marine banners helpful but either way let me know your thoughts in the comments below. 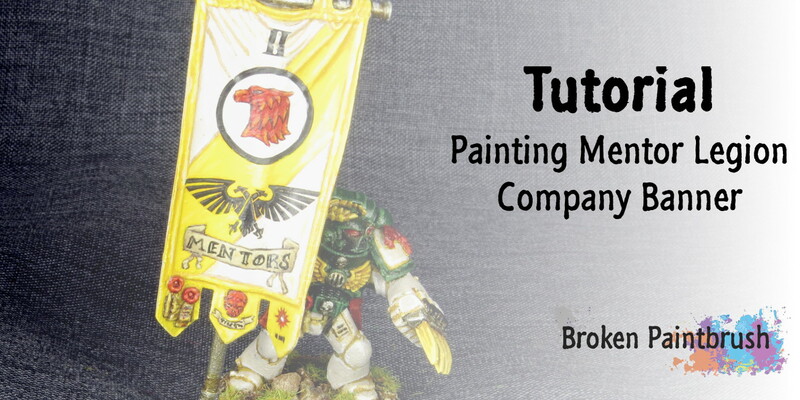 Also, while working on this article I found another great tutorial on Path of Seers for a Salamander Banner, so check out his post as well.